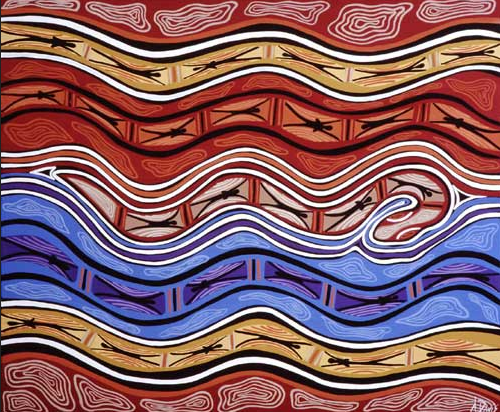 The Rainbow Serpent (Snake) is an important part of the beliefs and culture of the people of western Arnhem Land. Today the Rainbow Serpent is associated with ceremonies about fertility and abundance, as well as the organization of the community and the keeping of peace. The Rainbow Serpent is also part of the beliefs of Aboriginal people in other parts of Australia, but is best known from Arnhem Land. Paintings of the Rainbow Serpent first appear in Arnhem Land rock art more than 6000 years ago, and perhaps as early as 8000 years before the present, as the seas rose after the last Ice Age. Characteristics of the Rainbow Serpent vary greatly from group to group and also depending on the site. Often viewed as a female generative figure, the Rainbow Serpent can sometimes also be male. She has both powers of creation and destruction and is most strongly associated with rain, monsoon seasons and of course the colours seen in rainbows which arc across the sky like a giant serpent. Far off in Dreamtime, there were only people, no animals or birds, no trees or bushes, no hills or mountains. The country was flat. 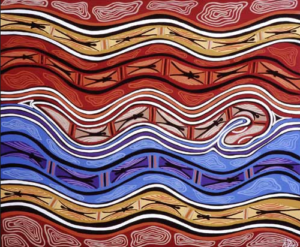 Goorialla, the great Rainbow Serpent, stirred and set off to look for his own tribe. He traveled across Australia from South to North. He reached Cape York where he stopped and made a big red mountain called Naralullgan. He listened to the wind and heard only voices speaking strange languages. This is not my country, the people here speak a different tongue. I must look for my own people. Goorialla left Naralullgan and his huge body made a deep gorge where he came down. He travelled North for many days and his tracks made the creeks and rivers as he journeyed North. Goorialla made two more mountains, one of the Naradunga was long made of granite, the other had sharp peaks and five caves and was called, Minalinha. One day Goorialla heard singing and said, “Those are my people, they are holding a big Bora.” At the meeting place of the two rivers, Goorialla found his own people singing and dancing. He watched for a long time, then he came out and was welcomed by his people. He showed the men how to dress properly and taught them to dance. A big storm was gathering, so all the people built humpies for shelter. Two young men, the bil-bil or Rainbow Lorikeet brothers came looking for shelter but no one had any room. They asked their grandmother, the Star Woman but she had too many dogs and couldn’t help them. the Bil-bil brothers went to Goorialla who was snoring in his humpy but he had no room. The rain got heavier and the boys went back to Goorialla and called out that the rain was heavy. Goorialla said, “All right come in now.” The Bil-bil bothers ran into Goorialla’s mouth and he swallowed them. Then he began to worry about what the people would say when they found the boys missing. He decided to travel North to Bora-bunaru, the only great natural mountain in the land. Next morning the people found that the boys were gone and saw the tracks of Goorialla and knew that he had swallowed them. You may never see these lakes or mountains, but after the rain you will see his spirit in the sky , which is the rainbow. This is the reason why he is called Goorialla the Rainbow Serpent.